As it turns out, my fantasy football team lost it’s first match against Hank Kingsley’s HeyNow Jamboree. But last week’s setback wasn’t a complete loss. I learned some things. These game breaking performances were good for a total of 60 fantasy points which was enough to give HeyNow Jamboree a 114-93 victory in my fantasy season opener. I also realized some things about my team. The first thing I realized is that the Chicago Bears defense/special teams is sicker than I was when I had allergies last week. And yes, I mean sick in a good way. The Bears ate the Atlanta Falcons alive on the way to a 30-12 win in the Windy City. The only problem with that statement is that my starting quarterback is the QB for those same Dirty Birds; a team that allowed five sacks, lost two fumbles, and gave up a defensive touchdown on Sunday. Falcons QB Matt Ryan struggled to escape the pass rush and only found the end zone once. Lastly, I learned that gambling on rookie tight ends isn’t worth the risk. I drafted rookie St. Louis Rams TE Lance Kendricks in the last round of my draft. Kendricks was praised as a popular sleeper pick by many fantasy experts. It was hard not to take the rookie after he compiled 155 yards receiving and three touchdowns in the preseason. After hauling in one catch for 18 yards in week one, I dropped Kendricks. To replace him, I picked up Patriots TE Aaron Hernandez off waivers. I’ll post an update before the games on Sunday. 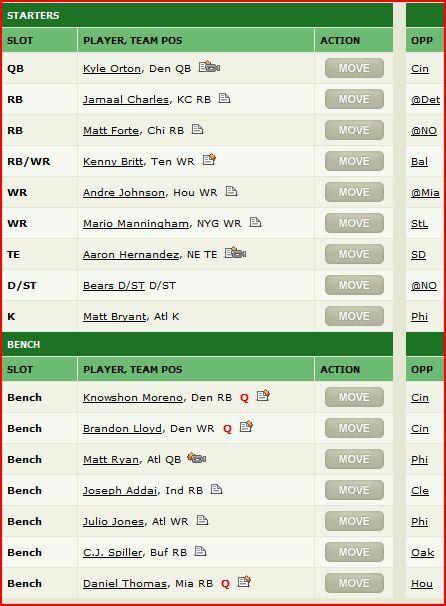 Hopefully my team will have better luck this week against The Johnny Utahs. I’m thinking about doing my own weekly positional rankings for fantasy football. I’ll keep you posted on that. Bleacher Report is still processing my application and writing sample but, you can checkout my b/r profile here. I have a BA in Journalism from the University of Alabama. Currently, I'm pursuing a career as a sports writer. You can contact me at bmorgan279@yahoo.com.